IN 5 - 7 DAYS. 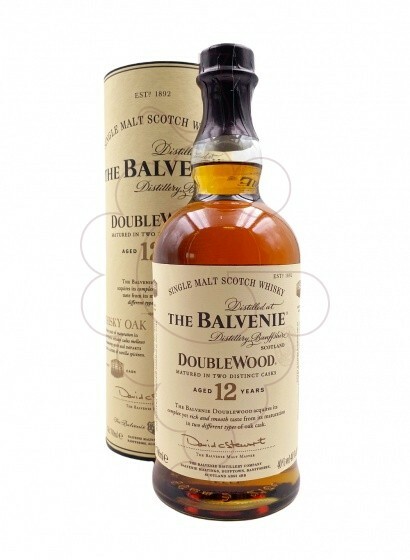 The Balvenie DoubleWood is 12 year old single malt which gains its distinctive character from being matured in two woods. Over its period of maturation it is transferred from a traditional oak whisky cask to a first fill European oak sherry cask. Each stage lends different qualities to the resulting single malt ~ the traditional casks soften and add character, whilst the sherry wood brings depth and fullness of flavour. In nose we notice sweet fruit and Oloroso sherry notes, layered with honey and vanilla. Smooth and mellow in mouth with beautifully combined flavours ~ nutty sweetness, cinnamon spiciness and a delicately proportioned layer of sherry. His finish is long and warming. Whisky Balvenie Double Wood 12 Years, one of the more than 9000 products you can find in our online shop. We have received your rating correctly. It will be published as soon as it is validated. It was impossible to send your rating. Try later, sorry for the inconvenience.